Finally got around to using M101. All I can say is WOW. I found a new love. I`d say there was "no mess" with M101 & only a minimal amount of dusting. In My Humble Opinion M105 vs M101 are at opposite ends of the bell curve. They both cut great. 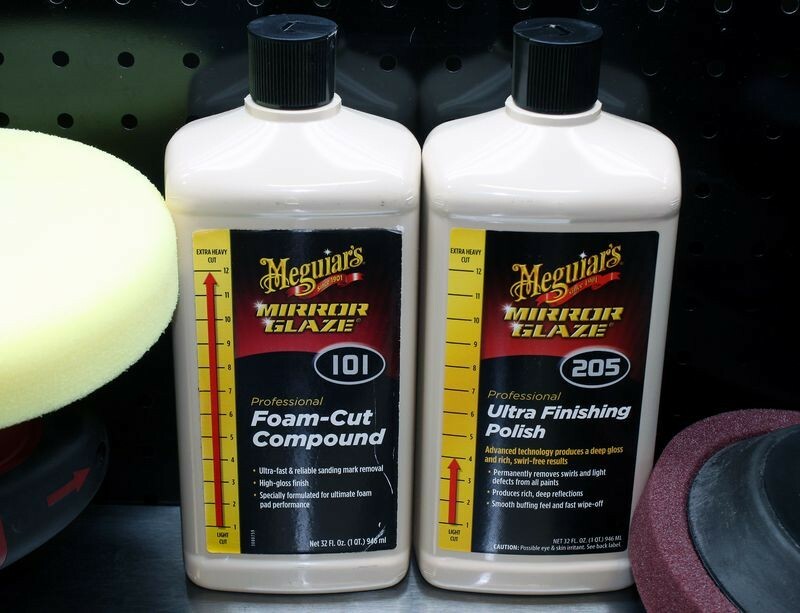 M101 is no mess, longer work time and a sweet finish. I believe I have found a new one-two go-to combo. When can we get Gal? I QD`d my tool box. "In the business world, the rearview mirror is always clearer than the windshield." I haven`t washed our Equinox in about 3 months, it hasn`t been driven 200 miles since then and has been raining all the time. Decided to clean it up real good and reapply PB EX Sealant. It needs a real good decon (tar everywhere on the bottom) but that can wait till spring. I need to clean the truck up real good, but I`m waiting to trade it in in a month or two, so I`ll wait for a good detail then. 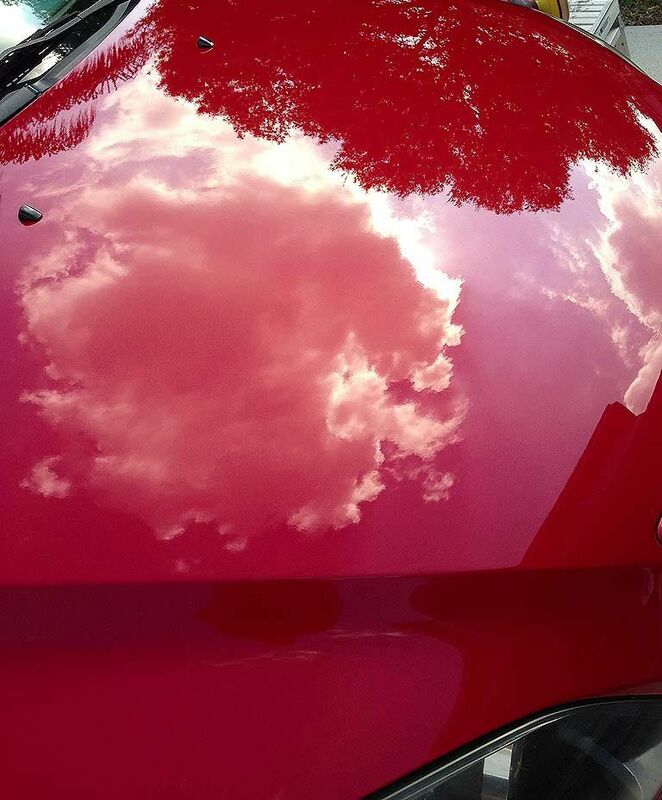 I detailed a clients Red metallic Mazda 10 year old vehicle. I tried both M100 and M101 with a DA using Surbuf pads, Megs MF cutting Disc and Lake Country 5.5" Flat Orange Foam Pads. I had very interesting results with both M100 and M101 using a DA with the different pads. M100, Megs 5" Microfiver cutting disc and a PC7424xp primed and ready. Also used M101 on a Flex PE-14 rotary with a 5" BP and LC 5.5" orange flat pads. Never got around to trying M100 on the rotary with wool. I stayed inside due to the snow, but I did order some more M101, a Rupes 21, and some more Finest for next week. How do you feel about the m100 vs m101 comparison, specifically when using MF pads. 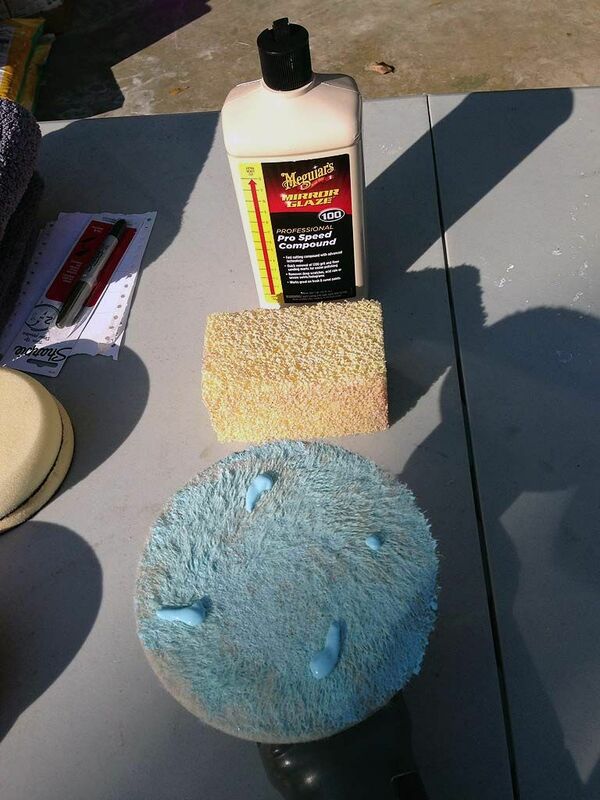 Also, what is that sponge in the above picture? How do you feel about the m100 vs m101 comparison, specifically when using MF pads? 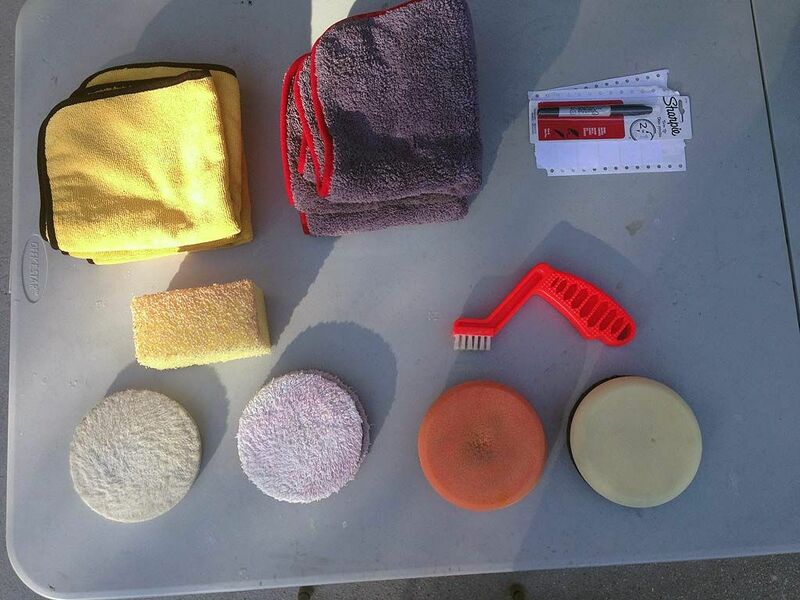 Also, what is that sponge in the above picture? After using both products with a DA I personally feel M101 wins above M100 Hands Down! I`m sure M100 has its place with a rotary & wool but IMHO it didn`t compare to M101 w/DA. I haven`t tried M100/rotary & wool yet. This was my comparisons of M100/M101 with a DA. M101 finished down so well I didn`t even use M205 as a follow up. For me M101 was 1 step. I`m amazed at the finish. One pad (orange), one polish (M101) & I had a "showroom" finish. No multi-pad/multi-stage...put right index finger in your left nostril & hop counter clockwise. One pad - One Polish - Done. and the orange pad to boot! Did I mention I really like M101? So to answer your first question. Did M100 work with a DA? Sort of, I went over areas multiple times and there were still swirls. Now to answer your second question. What`s the sponge? I don`t have compressed air to constantly keep the microfiber discs clean. 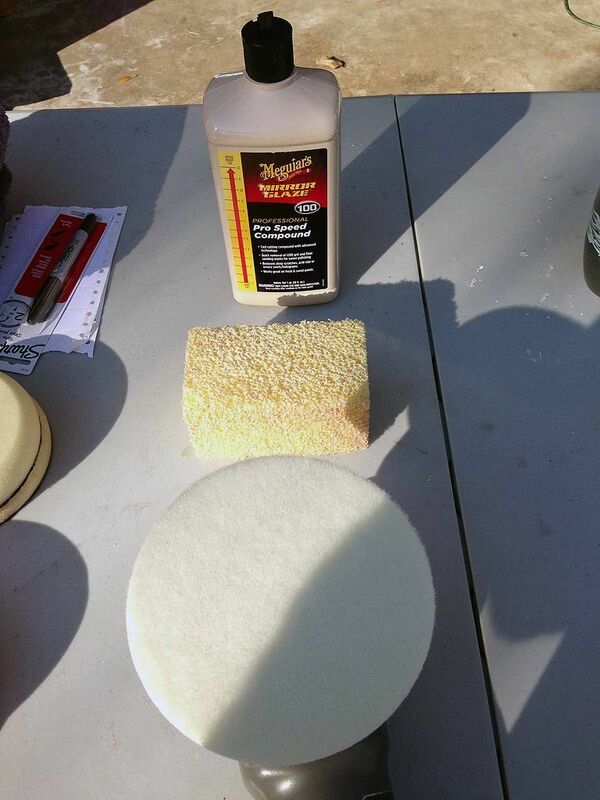 I`ve been using the Pinnacle Safe Scrub Bug & Tar Pad for years to clean MF discs on-the-fly. I found when using M101 with orange foam pads you need to constantly keep the pads clean. Clean at least once between each panel & sometimes (usually) a time or two during the panel. For on-the-fly I use the Foam Pad Conditioning Brush. I`m amazed at the "dust" when cleaning. I see several here try and decide on on one two models, which one did you select? I chose the 15. I have a Flex and a UDM 1.0. For what I do the Flex is fine for correction but I use the DA more for AIO/paint cleaning and LSP application. I had planned to replace the UDM already with the GG but the reviews were not much different than the prior models so decided why wait. I have worked planned soon as the weather warms up so decided to be ready.